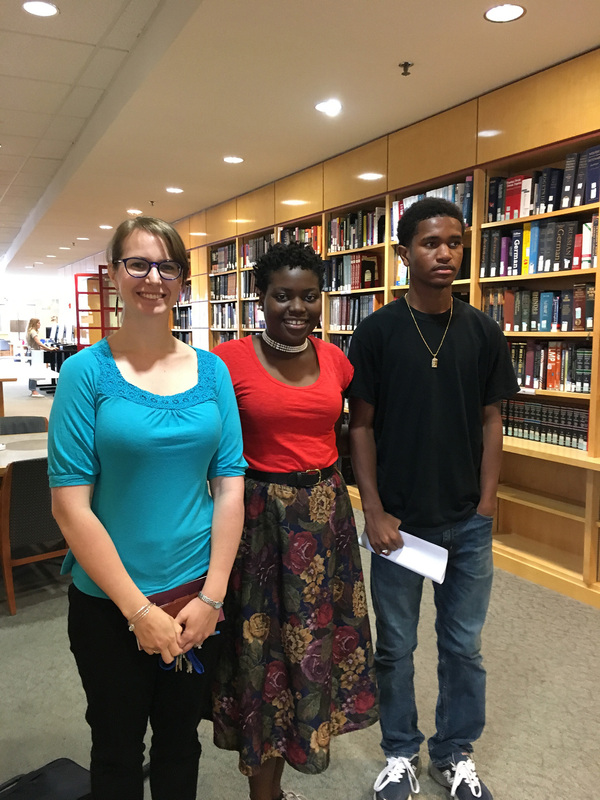 High School summer interns Batya Schwarz, Triage Eaddy, and Eugene Famba. Homewood Museum hosted three high school interns from Baltimore in the summer of 2017. Two interns, Eugene Famba and Triage Eaddy, were from the Bloomberg Arts Internship coordinated by the Baltimore Cultural Alliance. 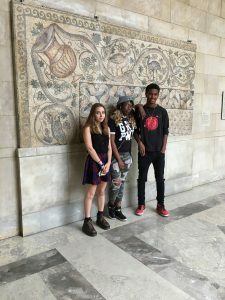 One intern, Batya Schwarz, worked with Homewood Museum directly to arrange a non-credit volunteer summer internship. 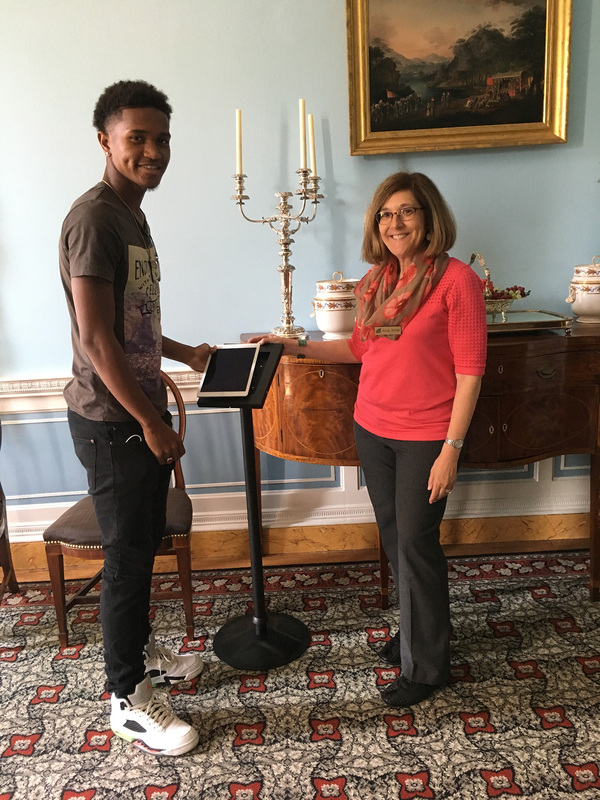 Eugene Famba was a rising senior at Digital Harbor High School and worked with museum director Julie Rose to create a history exhibit for Homewood Museum. 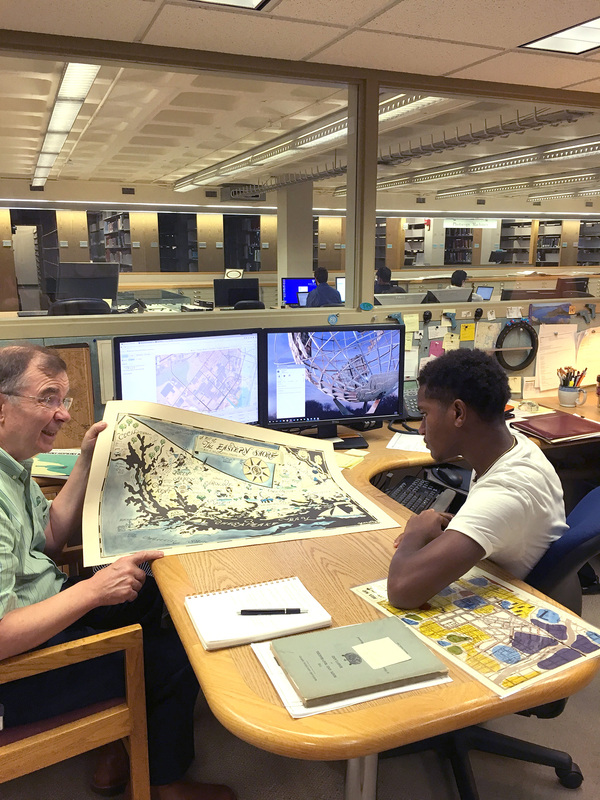 Eugene used historical maps, paintings and archival materials from area museums and Sheridan Libraries Special Collections to create original artwork for his digital presentation called Enslaved at Homewood. The digital history exhibit focuses on lives of the free and enslaved families at Homewood during the first quarter of 19th century. 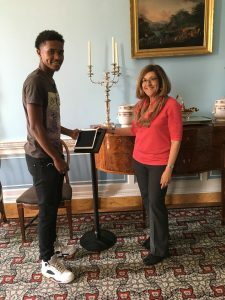 The exhibit is available on an iPad-kiosk and is on view through 2018 at Homewood Museum. Pieces from artist Eugene Famba’s “Enslaved At Homewood” exhibit, 2017. 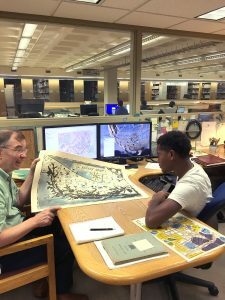 Eugene Famba with James Gillispie, GIS Librarian and Curator of Maps in the GIS lab on MSEL A-level. Intern Triage Eaddy was a rising senior at Bard High School Early College. She worked with JHU student Julia Zimmerman under the direction of Jackie O’Regan, Curator of Cultural Properties. The team created an audio tour of the university’s outdoor sculpture collection. Triage worked alongside the Homewood staff and volunteers. Batya Schwarz (pictured in the top photo) is a Baltimore resident who commutes to Melvin J. Berman Hebrew Academy in Rockville, Maryland during the school year. Batya worked with Julie Rose to research, write, and illustrate an interpretation panel for the exhibition, As Precious as Gold: History of Tea Caddies from the Bramble Collection. Batya learned how to use primary source documents and the online newspaper database to collect information about tea commerce in early Baltimore. Batya’s work resulted in an interpretation panel as part of the Tea Caddies exhibit, on view through December 31, 2017. High-Energy Physics Articles for Everyone!